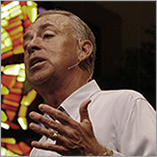 Today we welcome Ron Deal to First Baptist Church. Ron will preach all the weekend services as well as lead a seminar on Sunday afternoon for step parent families and/or blended families with the possibility of establishing a ministry for these families. We are thankful for Ron and his ministry. Beginning in August I, and all our campus pastors, will preach a series of sermons from the Epistle of James entitled “What Every Christian Needs to Know.” We are excited about this collaborative effort as we seek to equip the church to do the work of ministry. James, the brother of our Lord, served as leader of the church at Jerusalem. He wrote his epistle to dispersed believers. They were dispersed by the persecution against the church in Jerusalem. If we are correct in dating the letter in AD 46, those who first read the communication from James had only been believers for up to 15 years. Most of these would have come to faith in Christ more recently than that. They needed to hear about the issues of their day and every age. We need the same kinds of help as they did. James dealt with the big issues such as trials and troubles, wisdom and how you get it, and the relationship of faith and works. All of the campus pastors are excited about this series. Although we will not preach the same sermons, we will preach from the same passages. We believe it will be good for all of us. Over the next few weeks I will introduce our campus pastors and give you a report about this significant part of FBC Covington.